Know Hialeah Class of 1961 graduates that are NOT on this List? Help us Update the 1961 Class List by adding missing names. Class of 1961 55 year reunion is at the Shores Spa and Resort in Daytona Beach FL. Please contact Robert Davis at (931) 636-XXXX for further details. The reunion committee needs to know how many are coming in order to commit to the space at the hotel. The plans are all set for the 2018 HHS Class of '61 Reunion. It's at the SHORES RESORT & SPA, (same place) in Daytona Beach Shores, FL on SEPT. 9-11, 2018. Room rates are $109.00, $139.00,& $149.00 plus taxes and a discounted (Usually $20.) resort fee of $10.00 per night which includes self-parking, wi-fi, two bottles of water, use of fitness center & DVD library, daily newspaper, local phone calls and a complimentary S'mores Kit. IDENTIFY YOURSELF as a member of our group. Reserve early as only a limited number of rooms are available at these special rates. Check In time is after 4:00 PM and check out is 11:00 AM unless you arrange differently. We are planning a laidback, casual atmosphere for all the events. ASAP......As we have to provide guarantees to the hotel regarding attendance. Consider this as your NOTIFICATION!! We are no longer mailing out this information. Be sure and pass it on to everyone you know who might be interested in attending. We will post it on CLASSMATES and on the HHS ALUMNI page. We all are looking forward to seeing everyone again. We hope you will plan to attend!! THERE IS AN ATTACHED FORM TO SEND BACK WITH YOUR CHECKS. !!! More 1961 alumni from Hialeah HS have posted profiles on Classmates.com®. Click here to register for free at Classmates.com® and view other 1961 alumni. 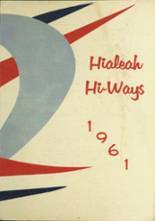 Alumni from the Hialeah High School class of 1961 that have been added to this alumni directory are shown on this page. All of the people on this page graduated in '61 from Hialeah . You can register for free to add your name to the HHS alumni directory.